Today was a glorious day for riding, so I took my bike to the grocery store to pick up a couple of items, instead of driving. Here's the entrance to Fortinos in Maple. It does have a bike rack (arrow on the left), but it's the bad bike parking type. 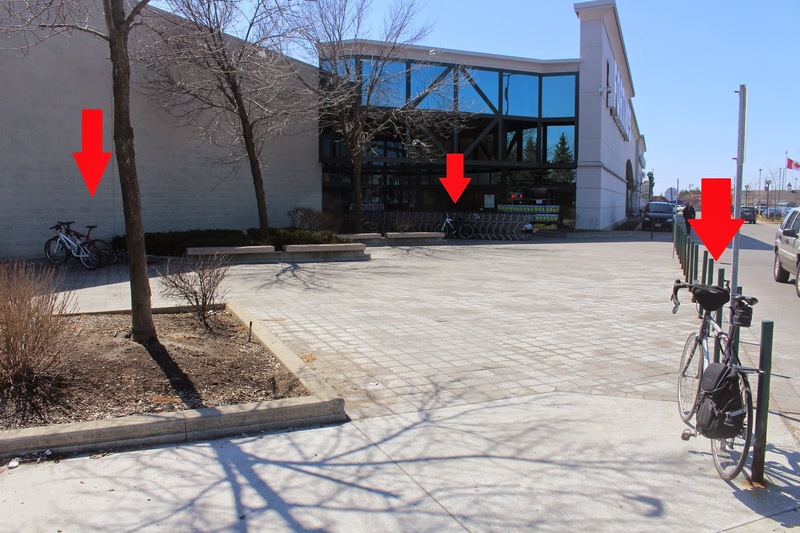 The middle arrow points to a bike leaning against some grocery carts, and the right arrow points to a bike (mine) locked to a sign. I've opted not to use the wheelbender bike rack on the left. See next photo. Businesses need some guidelines on what bike parking is acceptable and not. 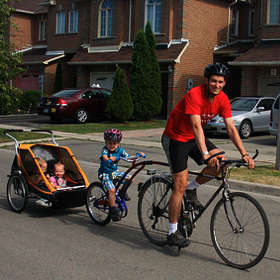 People in Vaughan do bike places. Quality bike parking is a small measure, but it's good for business and sends the message that "we care about cyclists and we care about our City".